Visiting hospital for the first time can be a daunting experience for anyone – especially children. To make it a little less scary we recently took part in a Hospital Familiarisation Program – an educational program run by the Association for the Wellbeing of Children in Healthcare (AWCH). Nurse Clair came along one morning, equipped with her nursing bag and rag doll “Katie” – a child-size patient and Nurse Clair’s trusty side kick. Together they talked about some of the reasons why children might have to go to hospital, different ways that they might get there, and what actually goes on inside hospitals once we arrive. A few willing patients stepped up to help demonstrate some of the things that doctors and nurses do. Blood pressure was checked; healthy beating hearts were listened to; temperature was checked; and “Katie” had a drip put in her arm. 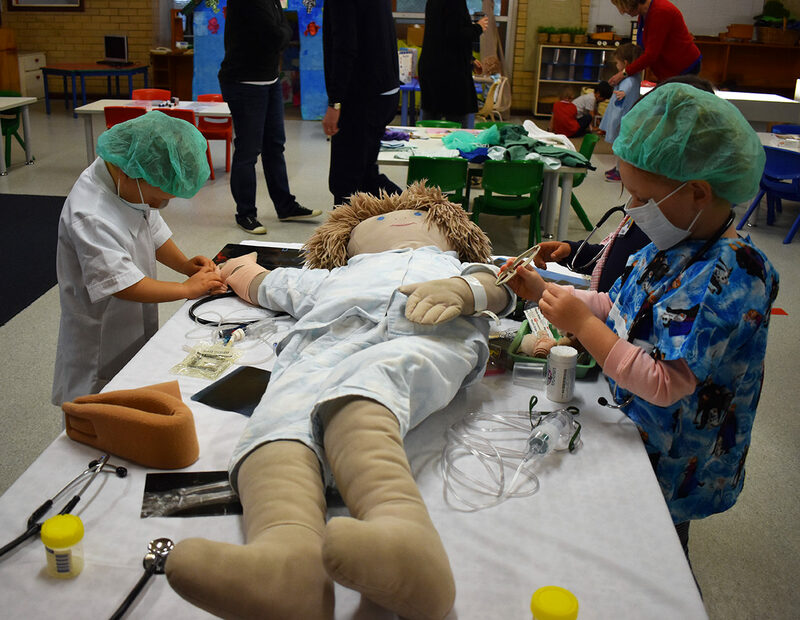 Undoubtedly the highlight – as you can imagine – was when the children dressed up as doctors, nurses and patients to put their new skills to the test. Heads were bandaged, band-aids were applied and everyone took turns using crutches and having rides in the wheelchair. It was a fun and informative morning, and an important part of our kindy curriculum each year. Hopefully, none of the children will be visiting hospital anytime soon – but if they do at least they will be a little more prepared, a little less scared and they will know what safe hands they are in when they arrive.